The take-away from CoreLogic's report on its August Home Price Index is that home price appreciation during the month was the slowest in two years. The national index was up 0.1 percent compared to July while the year-over-year gain, while also indicating a slowdown, was still a strong 5.5 percent. Price gains were highest by a huge margin in Nevada with a 13.0 percent annual increase. Washington State prices rose 9.1 percent and in Utah the increase was 8.9 percent. Five other states posted gains of 7 percent or more including one surprise entry, West Virginia. "The rise in mortgage rates this summer to their highest level in seven years has made it more difficult for potential buyers to afford a home," said Dr. Frank Nothaft, chief economist for CoreLogic. 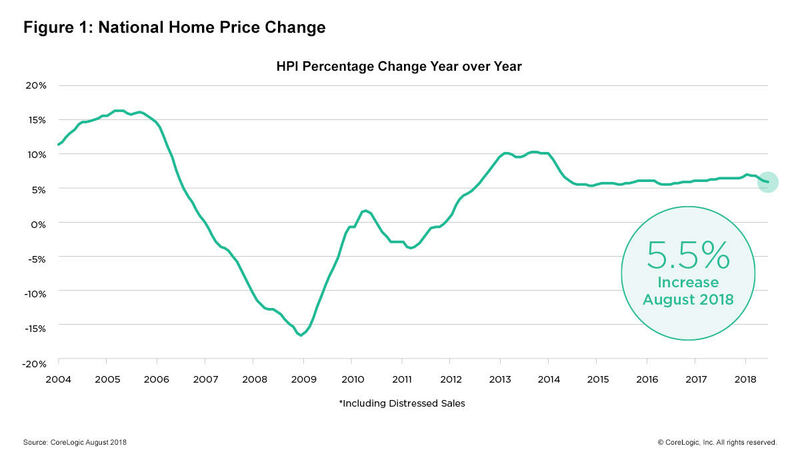 "The slackening in demand is reflected in the slowing of national appreciation, as illustrated in the CoreLogic Home Price Index. National appreciation in August was the slowest in nearly two years, and we expect appreciation to slow further in the coming year." CoreLogic's forward looking forecast is for home prices to increase by 4.7 percent over the 12 months ending in August 2019 and by 0.4 percent from August to September 2018. The deceleration in price gains, which has been noted by other major prices indices including those from S&P CoreLogic Case-Shiller and the Federal Housing Finance Agency, may be a little past due. CoreLogic also notes that its Market Condition Indicators (MCI), an analysis of housing values in the 100 largest metro areas (MSAs), finds 38 percent are now considered to have an overvalued housing market. The company puts MSAs in three categories, undervalued, overvalued, or at value, compared to each area's long-run sustainable levels. These are levels with local fundamentals that support home prices such as disposable income. An overvalued market is one in which prices are 10 percent higher than those long-run values; an undervalued market is down 10 percent from those levels. In August CoreLogic considered only 18 percent of the markets as undervalued and 44 percent were at value. When the universe was narrowed to the 50 largest areas that percentage that were overvalued jumped to 46 percent and the undervalued group dropped to 12 percent. At value areas ticked down to a 42 percent share. An August study by CoreLogic and RTi Research to look at consumer housing sentiment found that home prices are still rising in most markets, albeit at reduced rates. One reason that home sales are declining in some places is that sellers believe this will continue and, by waiting, they may be able to achieve a better price. The research found that many potential sellers intend to use cash from selling their current home for the downpayment on their next one, and 66 percent of those who intend to buy over the next ten years will need to sell their current homes to finance their next one. Thirty-five percent of those who bought recently used sales proceeds to do so.